304 pages | 78 B/W Illus. As concerns over climate change and resource constraints grow, many cities across the world are trying to achieve a low carbon transition. Although new zero carbon buildings are an important part of the story, in existing cities the transformation of the current building stock and urban infrastructure must inevitably form the main focus for transitioning to a low carbon and sustainable future by 2050. 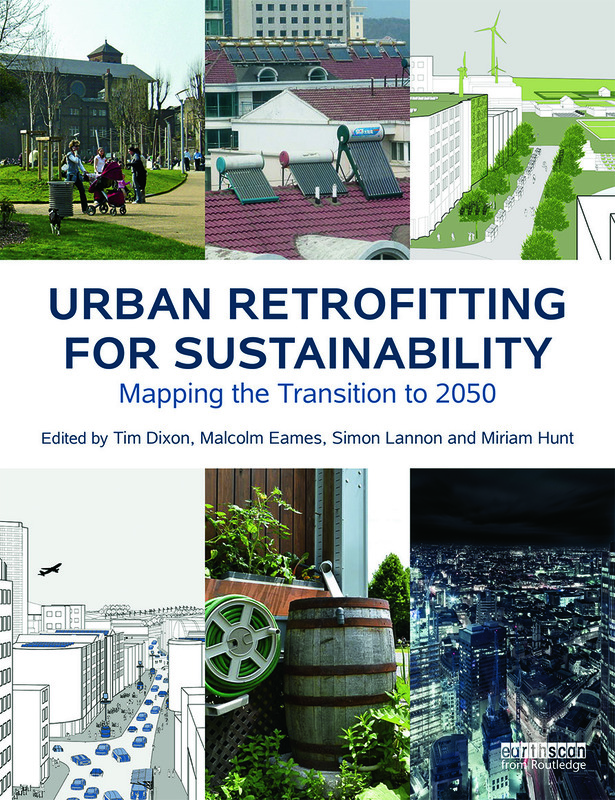 Urban Retrofitting for Sustainability brings together interdisciplinary research contributions from leading international experts to focus on key issues such as systems innovation, financing tools, governance, energy, and water management. The chapters consider not only the knowledge and technical tools available, but looks forward to how they can be implemented in real cities by 2050. Tim Dixon holds a professorial chair in Sustainable Futures in the Built Environment in the School of Construction Management and Engineering at the University of Reading, UK. He is currently leading the Urban Foresight work package in the Engineering and Physical Science Research Council (EPSRC) Retrofit 2050 consortium, and has recently completed funded research work on low-carbon cities for the Royal Institution of Chartered Surveyors (RICS) and on social sustainability for the EIB and Berkeley Group. His research interests cover (i) the property industry and its interface with the sustainability agenda; and (ii) futures work, focusing on socio-technical impacts at a range of scales. He is a member of the RICS Sustainability Taskforce. Malcolm Eames holds a professorial chair in Low Carbon Research with the Low Carbon Research Institute at the Welsh School of Architecture, Cardiff University, UK, and is the Principal Investigator for the EPSRC Retrofit 2050 project. With an academic background in science & technology policy and innovation studies, his current research interests focus on the interface between: S&T foresight; low-carbon innovation; socio-technological transitions; and urban sustainability. He previously led the EPSRC’s Citizen Science for Sustainability (SuScit) project and was formerly Director of the Brunel Research in Enterprise, Innovation, Sustainability and Ethics (BRESE) Research Centre at Brunel University. Miriam Hunt is a research assistant at the Welsh School of Architecture, Cardiff University, UK. She is currently working on the EPSRC Retrofit 2050 project, where she is involved in case study work exploring sustainability transitions in the Cardiff and Manchester city-regions; a foresight process designed to explore transitions in UK city-regions in the period 2020-2050; and disseminating the wider project work. Simon Lannon is a research fellow at the Welsh School of Architecture, Cardiff University, UK, where he has developed models and tools based on building physics principles to be used at all scales of the built environment, from individual buildings to regional energy and emissions models. The main focus of his research has been the development of software to model the energy use and emissions for large urban areas using Geographic Information Systems (GIS) and other applications. This software underpins the Energy and Environmental Prediction (EEP) model, a computer-based modelling framework that quantifies energy use and associated emissions for cities to help plan to reduce carbon dioxide (CO2) and other emissions.